When the Chinese master Daikaku first came to Japan in 1246, neither he nor his Japanese samurai pupils could speak the other’s language, and there are many instances in old accounts of the difficulties he had in communicating. For instance, in an old record in Kenchoji there is a passage describing an interview between him and Toyama, Lord of Tango, and in it comes the phrase Maku-maa-sun, maku- maa-sun, nyu-su-ku-ri-i-fu-ya. This was Daikaku’s Sung dynasty Chinese taken down phonetically by a scribe who did not understand it. The priest Ki Zentoku, a man of Szechuan who had come with Shoichi to Kamakura, transliterated this into the proper Chinese characters, which a Japanese scholar could then read as Maku-mo-zo, maku-mo-zo, ji-ze-gan-rai- butsu-ya, and Endo Moritsugu, who could read Chinese, translated it into Japanese: ‘No delusive thoughts, no delusive thoughts! Surely you are yourself from the very beginning Buddha!’ Many such cases are reported where what was said by a Chinese Zen master was transcribed into Chinese characters and then translated into Japanese by a Japanese scholar of Chinese. (We can see that often the phrase is repeated by the Chinese, a characteristic found even today.) In these cases the translation was then passed to the Japanese Zen pupil. Again, sometimes Ki Zentoku acted as an interpreter at the interview. But the main point was, that the teachers had mostly only a very limited knowledge of Japanese, which meant that the style of this Zen did not admit of many words, and classical koans like those of the Hekiganshu or Kattoshu could scarcely be appropriate for bringing warriors under the hammer, as it is called in Zen. It is stated clearly in the Kyochu Zakki (Jottings from the Ravine), the diary of priest Gio, that Daikaku used to make up on-the-spot koans suited to that particular pupil. This was the shikin Zen, or on-the- instant Zen. The fact that in the hundred koans of this collection there are so few which derive from Chinese T’ang or Sung koans bears out Gio’s statement. It is the spring that becomes the seed of the blossoms. adds that this gives a good idea of the old Kamakura Zen. If we cut the tree open to find them, where would they be? A number of these koan stories make reference to the Katzu! shout, with occasional reference to a power of using it to strike a man unconscious. This is a field in which emotional scepticism is as strong as emotional credulity. It may be noted that in these records the victims were in many cases professional fighters. For a relatively modern instance, see E.J. Harrison’s The fighting spirit of Japan (Foulsham). Harrison was a famous journalist in the Far East at the beginning of the century, who was also a considerable scholar, having a good knowledge of Japanese, of Russian, and even of that curiosity among languages, Lithuanian. In his youth however, he had been round the world in search of adventure, becoming for a time a lumberjack. He became an expert at Jujutsu, and then at Judo. In his early days he was a compulsive bar-room fighter; there are accounts of some of his exploits in memoirs of old hands in Japan, such as Martyr. He had to give this up when he took up Judo, but he remained one of the most aggressive men I have ever met. He would not have been easy to overawe or ‘hypnotize’, especially in the pride of youth. Nevertheless he found himself helpless before an old Japanese expert of the warrior shout. Imai’s comments reflect accurately the distinction between the Zen shout and that practised by the warriors. A leading theme in Trevor Leggett’s books is that in the spiritual traditions of the Far East, instruction is often given in the form of vivid images, rather than in terms of logical categories. Their function is not to charm, but to act as flint and steel in making a light. 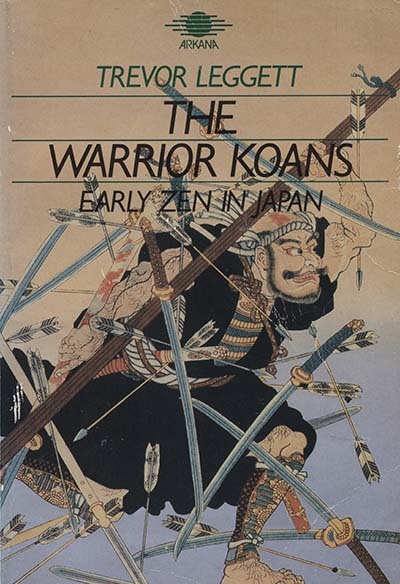 The collection of 100 odd koans here presented in translation was put together in 1545, under the name Shonan Kattoroku, from records in the Kamakura temples dating back to the foundation of Kenchoji in 1253 when pure Zen first came to Japan. For a long time the teachers at Kamakura were mainly Chinese masters, who came in a stream for over a century. As a result, this Zen was conducted between masters and pupils not fluent in each other’s language. On the political and religious background, there are explanations in my book Zen and the Ways, in which I translated about one quarter of these koans. In that book I gave some account of the then Rinzai system of koan riddles, and the modifications that were introduced when this line of Zen came to Japan. The text in its present form was reconstituted from fragmentary records in Kenchoji and other temples in Kamakura by Imai Fukuzan, a great scholar of Zen in the early part of this century. He was joint author, with Nakagawa Shuan, of a standard reference book of Zen phrases, Zengo-jii- Imai was himself a veteran Zen practitioner, as had been his father before him, and he knew personally many of the great figures of Zen at the end of the nineteenth and the first quarter of the twentieth century. In the small edition (500 copies) of the Shonan Kattoroku collection which he published in 1925, he put a number of notes of his own, and I have translated most of these along with the koans to which they refer. His Introduction to the text is put here at the beginning, along with extracts from his Introduction to a much longer work, to have been called Warrior Zen, of which this was to have been only the first part. That work was never completed, and much of the Introduction consists of long lists of Zen masters at the Imperial palace, with feudal lords, or teaching warriors in various parts of the country. However, there are some references to the present text, and these I have translated, along with a few personal details which he gives.